As we approach the 2016 corn and soybean harvest here in Benton County, it’s a great time for everyone driving the county roads to take a moment and reflect on farm safety. More farm accidents occur during the fall than any other time of the year and it’s everyone’s responsibility for safety. 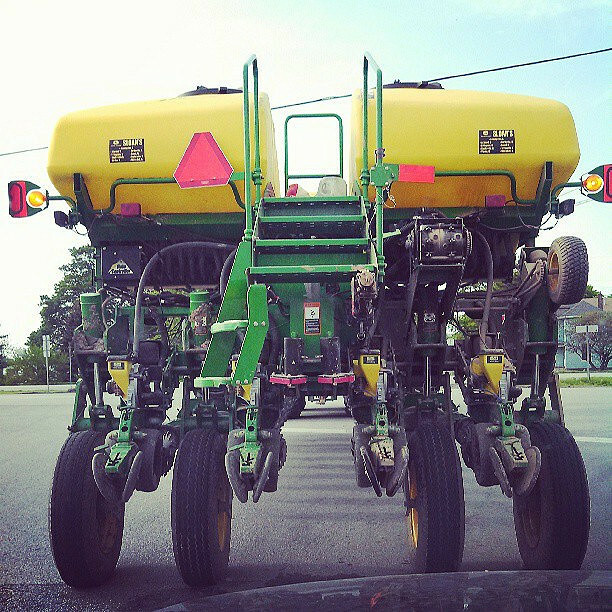 Bright & Reflective SMV Signs & Flashers should be easily visible on equipment such as this planter. One big danger during harvest are the slow moving vehicle on county roads. As farmers move equipment from field to field or haul grain on highways and rural roads, be on the lookout for flashing lights and bright slow moving vehicle signs. As a public service announcement, pay extra attention when driving on rural roads during harvest season, especially before and after work or school. Farm vehicles are large and move much slower than cars, the best advice is to slow down, pay attention and stay off cell phones while driving. Sunsets & sunrises can be blinding during the morning or evening commute in the fall. Please, pay attention and slow down at road crossings & intersections. Farmers, please make sure that Slow Moving Vehicle (SMV) signs are clearly visible on all off-road vehicles. Make sure SMV signs are in good condition and properly mounted. Use proper vehicle lighting & make sure your headlights and brake lights are functioning. Tractors & combines should use flashers at all times while on public roads. The American Society of Agricultural Engineers (ASAE) recommends two flashing amber lights, mounted at least 42 inches high, in both the front and rear. Turn on your headlights 30 minutes before sunset, until 30 minutes after sunrise. Also use headlights whenever insufficient light or unfavorable weather conditions exist. If your vehicle has automatic headlamps, check to make sure the switch is in the correct position. When trailering or pulling wagons, inspect hitches to ensure they are sturdy and properly mounted before towing or heading down the road. If equipped, use the safety chains. Be patient & share the road.